Trade show environments are usually busy, noisy and cluttered. Our design solution was single minded and simple, which helped to make it distinctive. Bold use of brand colours and minimal text meant that information was very easy to take in and Phonak’s brand presence was unmistakable. 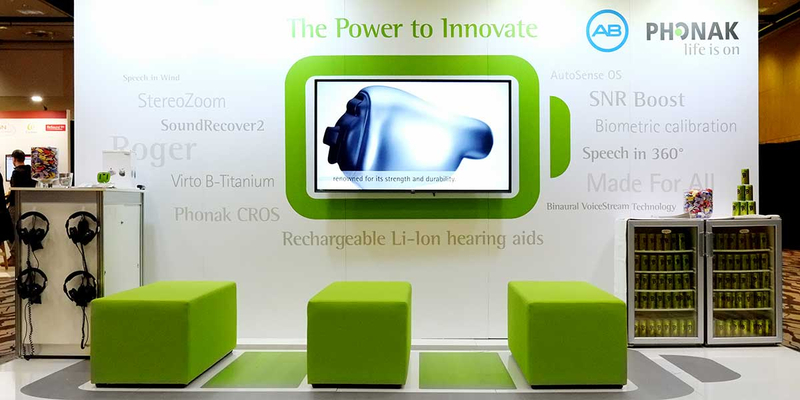 Phonak is a global provider of hearing solutions, represented in over 100 countries and a member of the Sonova Group. They have been committed to developing, producing, and distributing cutting-edge hearing solutions for more than 70 years. (Go to Phonak advertising case study). Phonak continuously challenge the limits of technology. 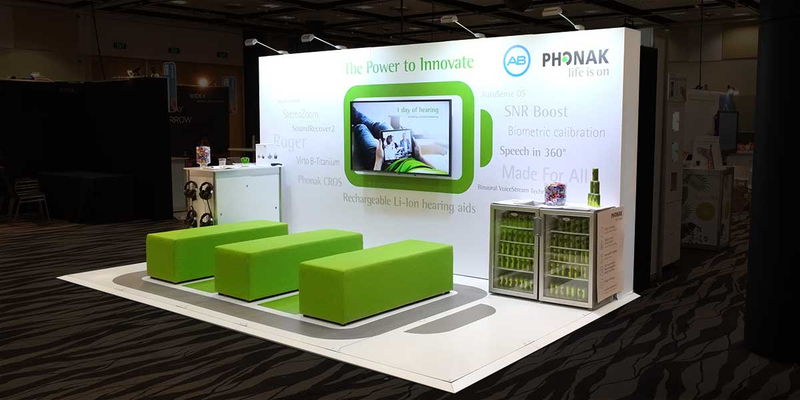 The design of their trade show stand at the 2018 New Zealand Audiological Society Conference at Sky City in Auckland needed to showcase their latest innovations. In particular, revolutionary rechargeable technology – the quickest charging, longest lasting rechargeable hearing aids. Step 1: We discussed the creative brief with Phonak and all the mandatory requirements. Step 2: Initial concepts were created and presented as simple 3D drawings to show what the finished trade stand design could look like. Step 3: Initial designs were refined and re-presented after client feedback. Step 4: Full size artwork was created for all of the trade show stand components. Step 5: We checked final proofs, reviewed a finished floor plan and the stand once assembled at the NZAS Conference. 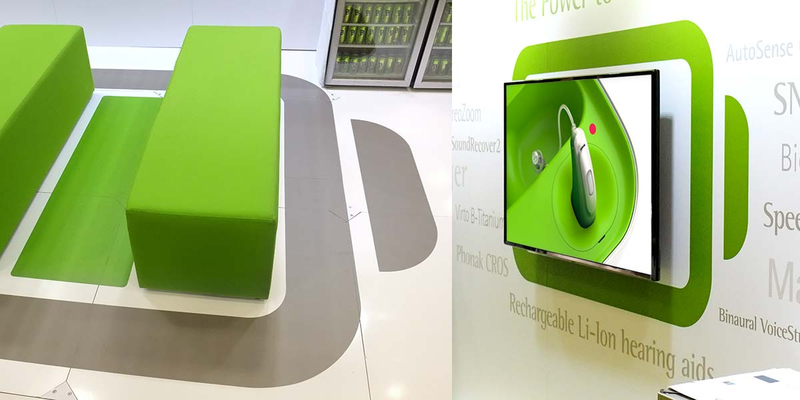 The finished trade show stand design originates from the idea ‘The Power to Innovate’. A very large battery symbol is printed on the floor of the stand. Five green ‘bars’ suggest the battery is fully charged. Two of the green bars are printed; the remaining three are 1.5m long, Phonak green, custom made bench seats. 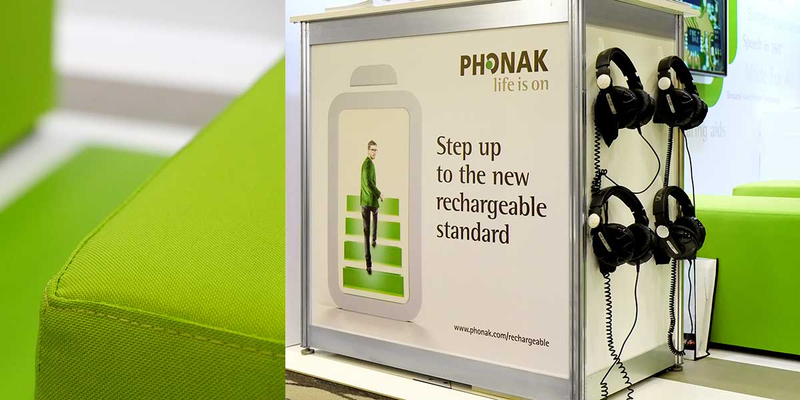 A Phonak green battery symbol is printed on the back wall of the stand. This becomes a frame for a 60“ flat screen TV, playing videos of new product innovations. Key product innovations are printed in tones of grey on the plain white back wall, to complete the less-is-more stand design. 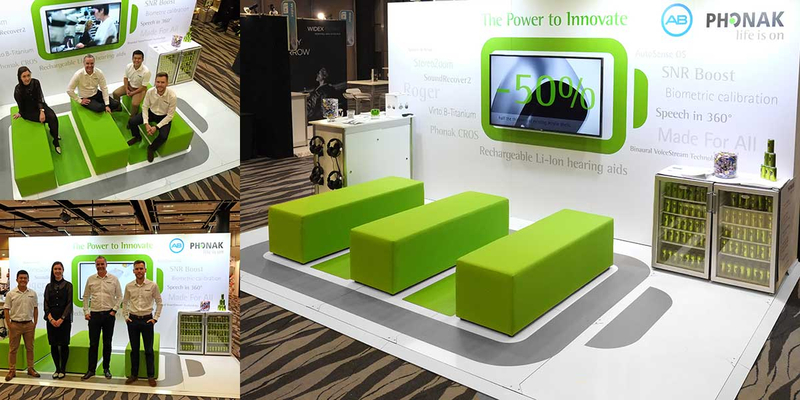 With the Phonak team on-hand during the 3-day conference, their aim was to maintain brand awareness, attract audiologists onto the stand and create conversations around their product innovations. And sit comfortably while doing so. Need help with trade show or exhibition stand design? We’ll present your brand at it’s best in a trade show, careers fair or exhibition environment. We’ll plan the space with you, provide scale visuals or models and create artwork ready for production. Angle’s team can design and deliver it all. Whatever shape or size, we create impact, add value and improve your brand presence. Find out more about our signage & large scale design services here.